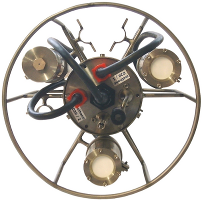 A methane sensitive detector is located in a detector room in the sensor head. The detector room is protected against water and pressure by a silicone membrane. The gas molecules diffuse through the membrane, following the partial pressure gradient between water and detector room, according to the Law of Henry. Hence, the concentration in the detector room is directly correlated to the concentration in the outside water. The correlation is expressed by the calibration formula. No internal moving parts or pumps, hence lower failure risk and lower power drain.